The XTERRA FB350 exercise bike features the same design and range of features as the FB150 model that we’ve already reviewed here. However, it has an extra set of handlebars attached to its seat and a small backrest. This places it in the semi-recumbent bike category. 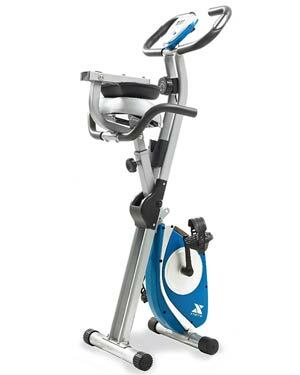 The XTERRA Fitness FB350 exercise bike features a durable X-type frame, made of steel tubing. Its main part consists of two parallel tubes slightly curved at the top where the handlebar attaches. The seat bar goes through these two parallel tubes and attaches to them at the middle. The drive and resistance elements are attached to the bottom section of the seat tube. All the steel parts in the bike’s frame are powder coated with a corrosion-resistant finish. The color used is light gray, this being the only color available for this model. The covers of the drive system are made of ABS material, their colors being blue & gray. The bike has a folding design. The two main frame elements can be folded together from the middle and locked in a folded or unfolded position via a pop-pin. With the frame folded, the unit’s footprint is approx. 20″ x 21″ (51 x 53 cm), while its height reaches approx. 50.5″ (128 cm). Conversely, with the frame unfolded, the bike isn’t extremely large either. Its base takes approx, 31″ x 21″ (79 x 53 cm), but the unit’s full length from the backrest and all the way to the front grips of the handlebar, is approx. 40.5″ (103 cm). These being said, the bike should fit a minimum usage area of 60″ x 50″ (152 x 127 cm). The fully assembled bike isn’t too heavy either. It weighs approx. 42.3″ (19.2 kg). This means it can be transported and assembled by only one person. Plus, once the unit is assembled, its relocation can easily be done via its front base wheels. One last aspect to mention here regards the unit’s weight capacity. This XTERRA exercise bike is rated for a maximum user weight of 225 lbs (102 kg). 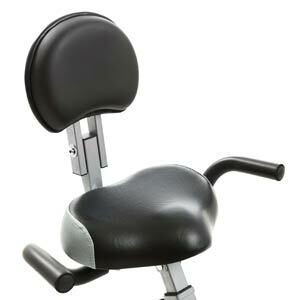 It’s also meant for seated workouts only; it does not support spin workouts or standing on the pedals. The bike’s saddle is similar to the one on the FB150 model. It is approx. 14″ (35 cm) wide, and has a contoured surface to provide optimal comfort. It does not integrate air-cell cushioning such as the seat on the Exerpeutic 4000, however, it does have an internal layer of foam padding. Its top is made of durable vinyl material with a synthetic mesh patch at the rear. The backrest is attached to a durable, dual bracket. It’s not extremely large but does have a thick layer of foam padding. It provides excellent lumbar support, and can also fold over the seat when the bike is folded for storage. The seat is 2-way adjustable (up, down). Its post features 7 adjustment notches. It’s designed to accommodate users between 4’10” and 5’10” (147 – 178 cm), and up to a weight of 225 lbs (102 kg). The bike’s handlebar is non-adjustable. It attaches directly to the front part of the main frame element via two bolts. Its side sections are covered by a layer of rubber-foam material in order to provide a comfortable and secure grip. It offers the possibility to adopt several grips, including parallel grip, close grip, or front grip. The side grips of the handlebar are equipped with metallic pulse sensors. 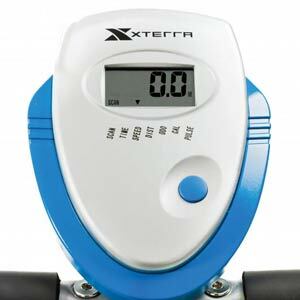 Therefore, if you hold on to them when pedaling, the meter unit can track and display your pulse rate. 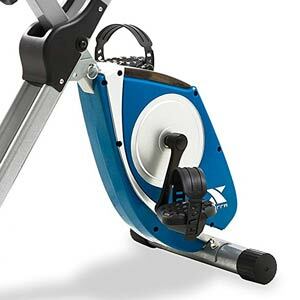 Since it’s a light-capacity exercise bike, the XTERRA Fitness FB350 doesn’t have a super-heavy flywheel. It weighs approx. 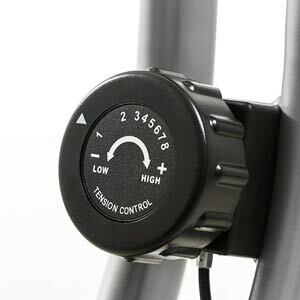 3.3 lbs (1.5 kg) and has a balanced design in order to provide a smooth pedaling motion. It is also bi-directional, which means it offers the possibility to pedal in reverse. However, you cannot coast on the bike; when pedaling in reverse, the resistance remains constant. The bike’s internal drivetrain uses a v-belt. This being said, the pedaling motion is almost completely silent. It also does not require lubrication as a chain transmission. The crankset features durable steel arms. The included pedals have a metallic core and a durable, non-slip ABS surface. They’re weighted, and also equipped with adjustable straps, so you can secure your feet. Although the crankset is pretty durable, standing up on the pedals is not recommended. Not only that it may lead to excessive internal wear, but due to the frame design, the position would also be very awkward and may lead to losing balance. The bike has a pretty narrow Q-Factor (spacing between the pedals). Its exact dimension is not specified, but it should be somewhere between 150-160 mm. This being said, your feet are naturally positioned on the pedals and there isn’t any additional lateral stress on the knees and ankles during pedaling as for bikes with a wider Q-Factor. 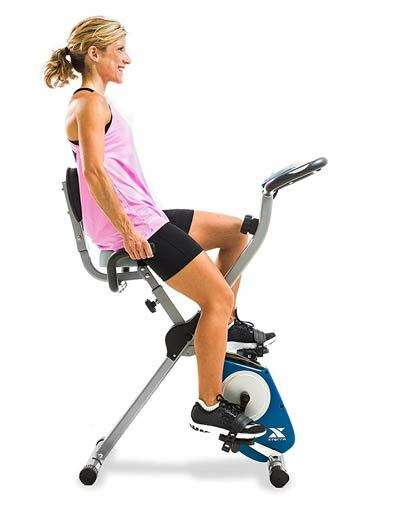 The Xterra FB350 exercise bike features a mechanical magnetic resistance system. This being said, it does not require an external power source. Also, the console plays no role in the resistance adjustment. The bike’s resistance system consists of a small magnetic brake which is attached to the dial at the top of the front part of the frame through a steel wire. By turning the dial clockwise, the brake moves closer to the flywheel which results in an increased pedaling difficulty. The unit makes available 8 levels of resistance. The first one is really light, great for recovery training, or warming up. 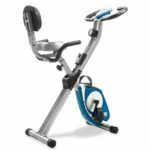 Conversely, the 8th level does provide a distinguishable increased pedal tension, giving you the possibility to reach a higher cardiovascular rate in a shorter period of time. The exercise meter offers the same feature range as the one included with the Sunny SF-B2721. It features an LCD display with large digits which tracks the most important workout metrics. Among them, we can count time, distance, total distance, speed, calories, and pulse. Speed is shown only in miles per hour, while distance is shown only in miles; the unit cannot be set to metric units. The meter unit is not telemetric. This means it can only read your pulse through the integrated stainless steel sensors. It cannot communicate with Polar or other types of HR chest strap transmitters. The meter unit is not compatible with any online fitness apps and does not have any preset programs. It also does not have goal settings. It only features one button which covers all of its functions. By pressing the button repeatedly, you can select the desired workout metric to be shown on the display, or you can select the Scan Mode which rotates all the metrics showing each one for four seconds. It also covers the Reset function; by pressing and holding it for a few seconds, you can clear all the values on the meter to zero. The unit requires two AA batteries as a power source. It starts up when you press the button, or when you begin pedaling. It also has a sleep mode to which it will enter after four minutes of inactivity on the bike. The two main parts of the frame come already attached together, while the drive and resistance elements are also pre-assembled. Therefore, you only need to attach the bike’s base tubes, the seat, the backrest, the handlebar, the pedals, and the console. This shouldn’t take more than an hour. All the tools required for the assembly are included. Also, the manual provides clear, step-by-step assembly instructions. Once the unit is assembled, maintenance doesn’t require much. Basically, you only have to check for loose bolts and parts from time to time. The internal parts should not require any lubrication or maintenance for a long period of time. No backlight on the fitness meter. The XTERRA Fitness FB350 is a semi-recumbent exercise bike, featuring a folding frame, a quiet belt drive, and a manual-magnetic resistance system with 8 distinct levels. It also includes a fitness meter which tracks the most important workout metrics. It’s a trainer designed for light cardio training, muscle toning, stamina development, and weight loss. It’s also an affordable exercise bike, offering excellent value for the price.